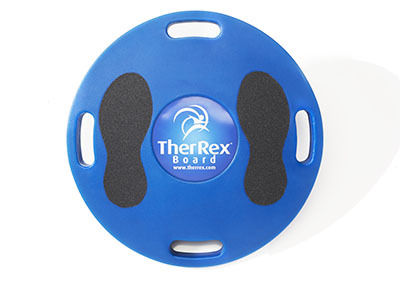 Get back in the game with the TherRex™ Balance Board! Its patented football shaped design allows for complete range of motion across all planes. Strengthening ankle muscles to help prevent injury before it happens. The TherRex™ Balance Board is a functional trainer that allows for range of motion across all planes. 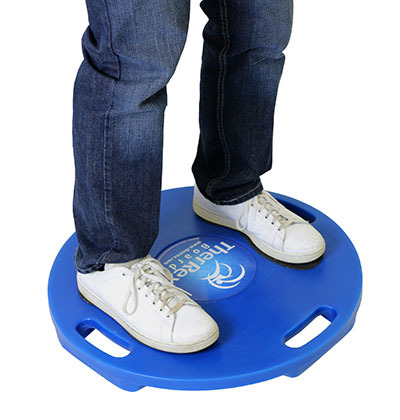 Through it’s hemispherical shaped bottom, the balance board allows the user to exercise and strengthen their ankles in the positions which ankle sprains occur. Target muscles are activated up to 100 percent of maximal muscle contraction, so that injuries do not occur in the future. By utilizing a football shape, all directions of balance are the same. Mounting and dismounting the board is made easy with stops designed with a flat edge to increase stability. In the seated and prone positions, the stops will make sure the board contacts the ground before your fingers do, to avoid pinch points. The TherRex™ Balance Board features two pairs of handles that surround the board to make it easy to use in seated and prone positions. Each pair of handles have two different arcs that correspond to the football shaped bottom. Allowing for exercises to be performed at two different intensities. Dimensions: 24" x 5.75" x 24"